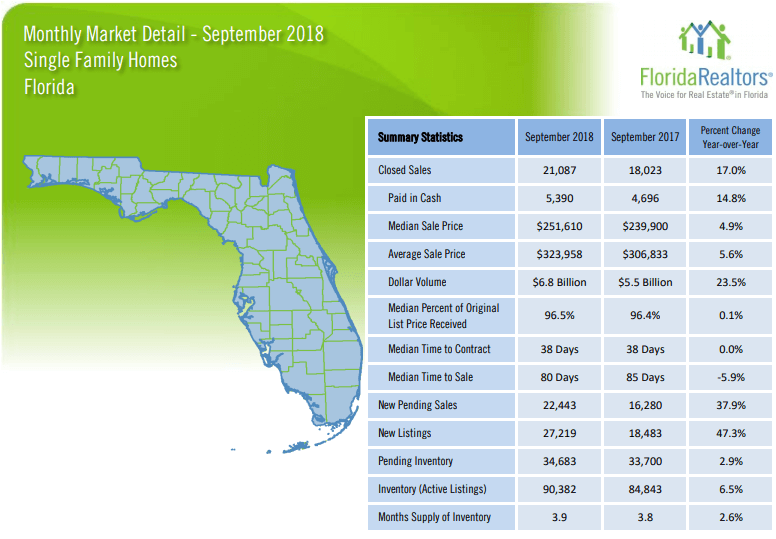 The Florida Single Family Homes September 2018 Market Report showed continued strong activity when compared to last year. Closed sales were up by 17.0% (were up by 4.2% in August) and new sales under contract (new pending sales) were up by 37.9% (were down by 2.6% in August). Prices are also continuing to rise, though at a slower pace for September than in months past. The median and average sales prices up by 4.9% and 5.6% respectively, compared to August’s 6.0% and 4.0%. The inventory of available homes for sale increased by 6.5% from last year. This is now a 3.9 months supply of inventory as Florida remains in a seller’s market with the advantage for sellers. (September of 2017 had a 3.8 month supply) A balanced market favoring neither buyers or sellers is considered to be one with a 6 to 7 month supply of inventory. Inventory continues to decrease which is putting pressure on rising prices and lower sales volume.